The Professional Mobile Phone Recorder is slim and elegant in it’s design with over 144 hours of recording time and over 20 hours of battery life. It easily snaps into any cell phone currently available (it plugs into any 3.55mm headphone jack). It can record on sound activation mode so there is no need to physically turn it on and off when a phone conversation begins. It is Mac and Windows compatible and records in MP3 format. 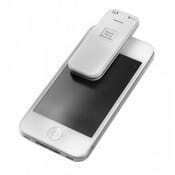 The Professional Mobile Phone Recorder also functions as a digital audio recorder.